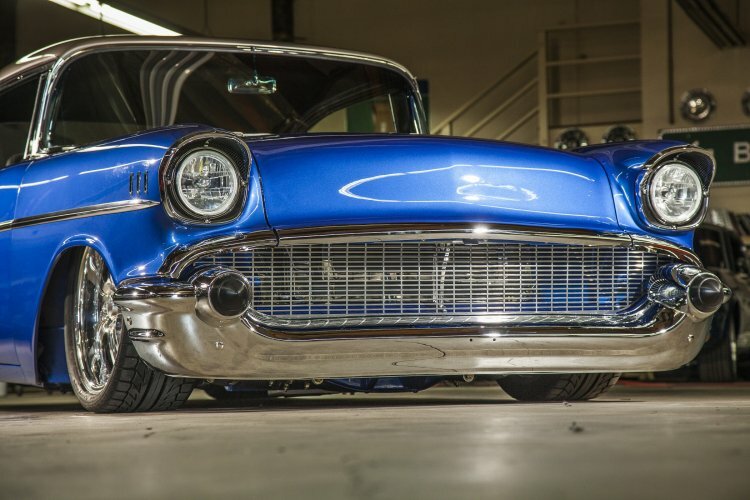 In the relatively short amount of time they have been around California based Bodie Stroud Industries (BSI) has built quite a name for producing some of the cleanest hot rod builds as of late. 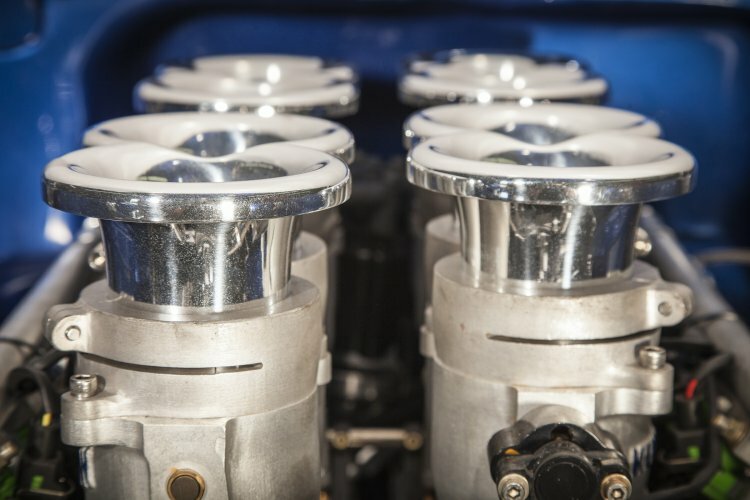 You may have seen their work in Hot Rod Magazine, Popular Hot Rodding, or even on Jay Leno’s Garage with the Toolman Tim Allen’s Chevy Camaro. They have a true taste for making sure that no details are overlooked when completing a project, and they are always the complete package of looks, power, and technology. 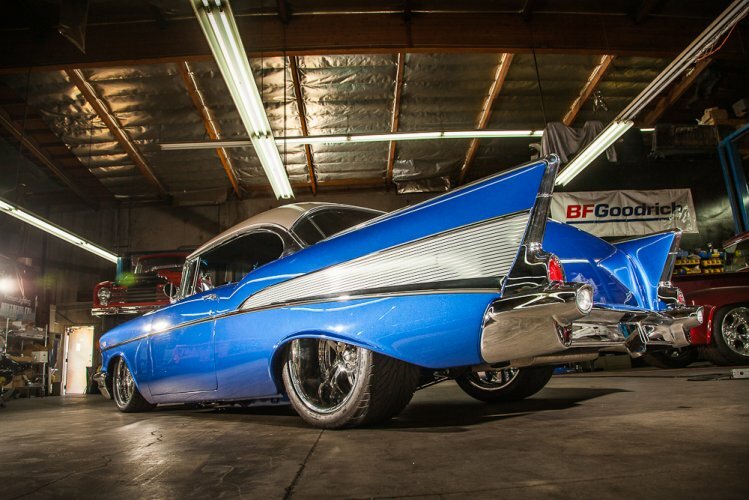 Well, Bodie has done it once again with this gorgeous build of a 1957 Chevy Bel Air for a close friend named "GMonster". This car is a true showcase of Bodie’s vision of hot rodding as his friend only provided a couple requirements for the finished product. Those requirements were that the car should be home to a big block engine and not some modern engine, and the paint had to match a nail polish provided by the client’s wife. 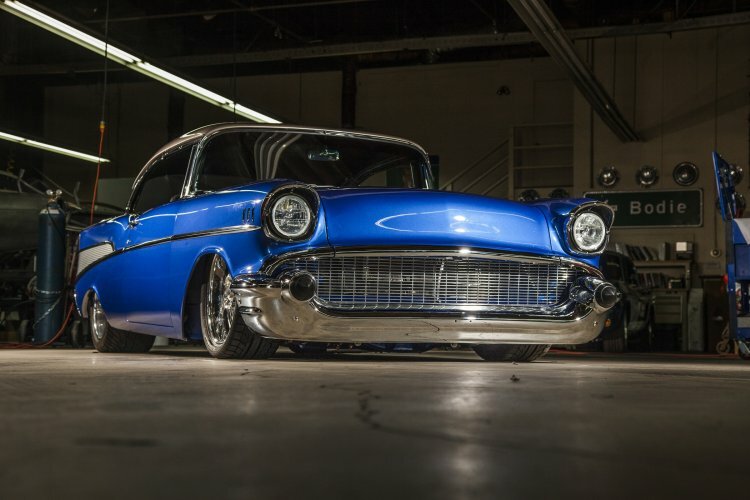 That shade of blue called “Blue My Mind” was matched using a Matrix System Automotive Finishes custom color. The rest of the car was all up to Bodie giving him free will to use every ounce of his talent the way he sees fit creating a show stopping car. Addressing the first request Bodie’s client/friend had for the car, a 509 Chevy big-block built by QMP Racing was slapped onto the motor mounts. This monster is rated at a ground shaking 800hp on 91 octane pump gas. While this approach is an age old tactic Bodie chose to go modern electronic fuel injection with a Kinsler Dragon Claw EFI system. This allows maximum reliability and the option to easily adapt to weather and elevation changes when on the road. Fuel flow is adequate with an Aeromotive A1000 pump pulling fuel in from a custom stainless steel fuel cell and controlled by Fast XFI Fuel Management. 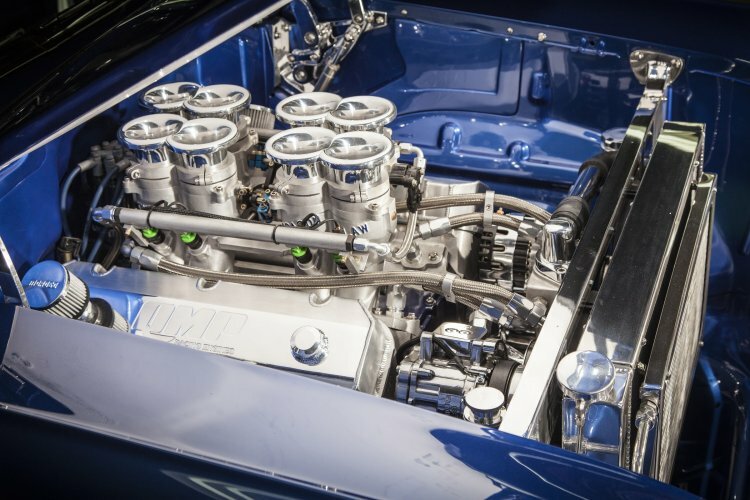 Completing the engine package is a set of custom headers by Bodie Stroud Industries with a 2” primary matched to a Magnaflow 3” stainless-steel. All that helps the 509 exhale the hot exhaust out as fast as it gobbles the air cool air in. Speaking of hot, Bodie covered the cooling duties with a Matson’s Radiator and twin 14” SPAL Electric Fans to keep temperatures in check, important in a high performing big-block beast like this. A Vintage Air a/c system was also fitted to keep the driver and other occupants chill when the mercury rises. When you start to put out close to four-digit horsepower, you have to be picky about what components are used to put that power to the ground. To handle the requirements Bodie installed a Chevy 4L80E heavy duty transmission which should be quite capable of the task. The next week links in power routing is the rear end which was upgraded to a tried and true Ford 9-inch with Strange internals connected by a sturdy 3” Polished Aluminum Inland Empire drive shaft. All these upgrades to transfer power would be worthless without the right set of rubber, and that is why a massive set of 29x15R20LT Mickey Thompson Sportsman S/R slicks sit out back. 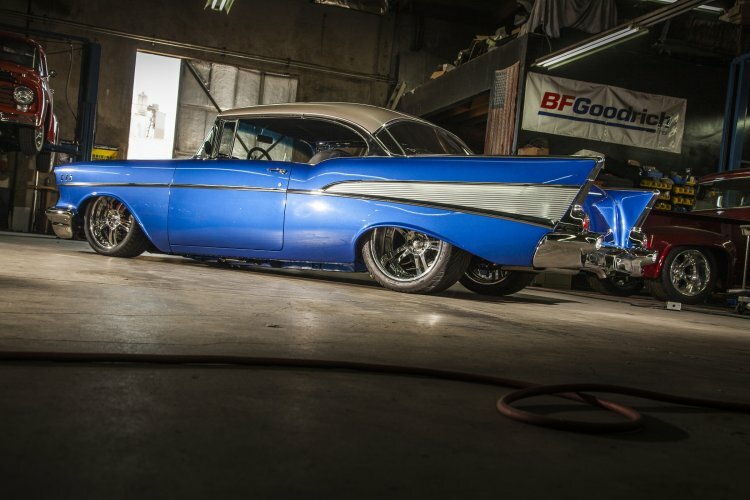 Up front, a set of 19x8 BF Goodrich G-Force Sport tires ensure this Bel Air can still be pointed and safely make it around corners in addition to its blistering straight line speed. Not forgetting that this heft of a classic car that could run 0-60mph in under 4 seconds BSI knew they needed a good brake setup. Going straight to the top shelf a set of 6-Piston Wilwood calipers were paired up in front and back giving plenty of slow to match the go. Proper chassis and suspension set-up is always the key to having a well-performing ride both on and off the track. 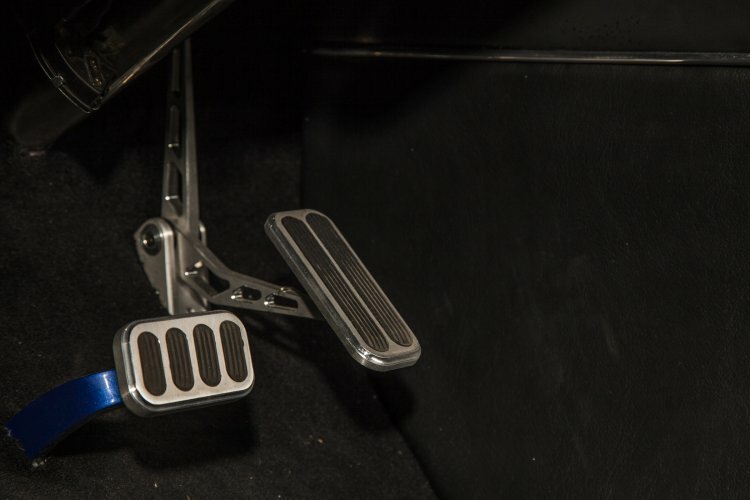 Given that Bodie Stroud Industries is a designer and manufacturer of custom suspension components it only made sense to handle those duties in house. BSI used the stock chassis with a few key customizations where it counted giving this Chevy a proper stance and improved corner ability. 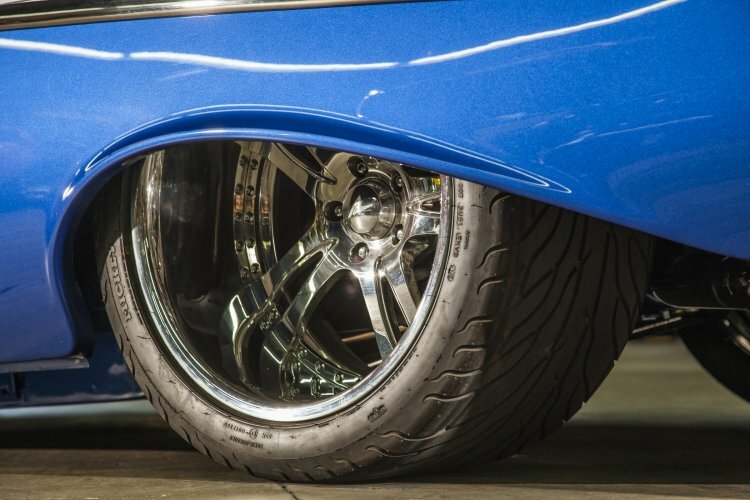 The front suspension is a Bodie Stroud Industries bolt-on control arms with EZ-Aline setup that helps to ensure simple and quick alignment of the front end. Out back there is a Bodie Stroud Industries four-bar set-up also with the EZ-Aline capability. A custom 1” front sway-bar was also utilized along with a full RideTech Coilover suspension completing the suspension tuning goals. 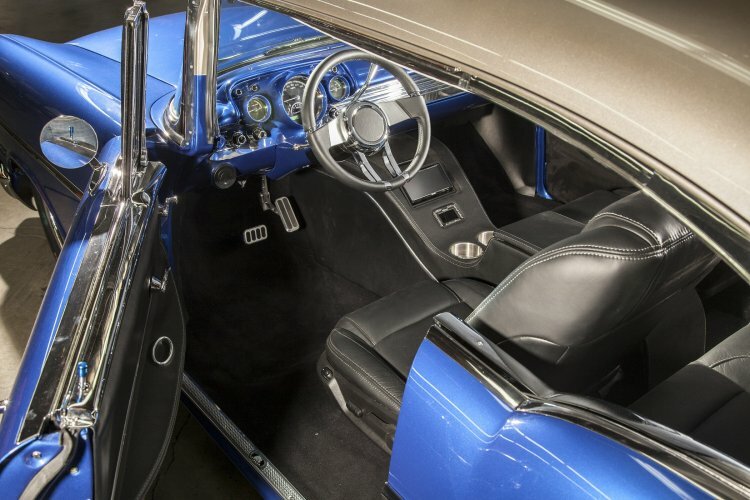 The last area to address with this car was the interior that also had every inch gone over to make the perfect result keeping things simple, but clean. The seats and center console were given a custom leather wrap in all black with white stitching. 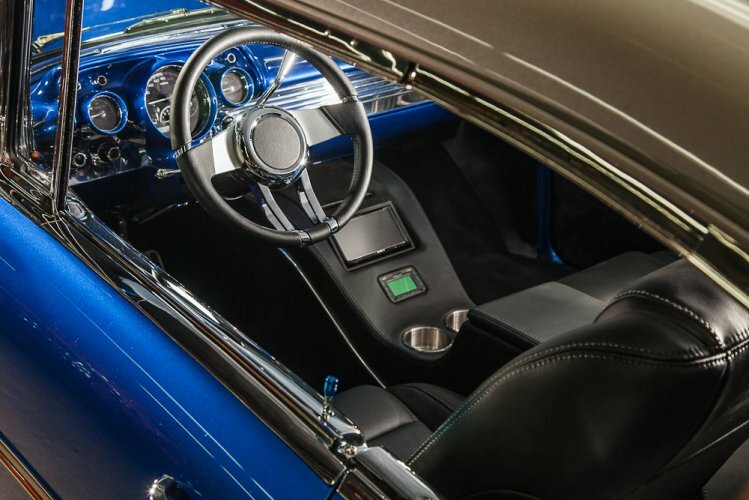 The dashboard was covered in the same Matrix blend for the “Blue My Mind” nail polish color, and the gauges are a set from Dakota Digital. 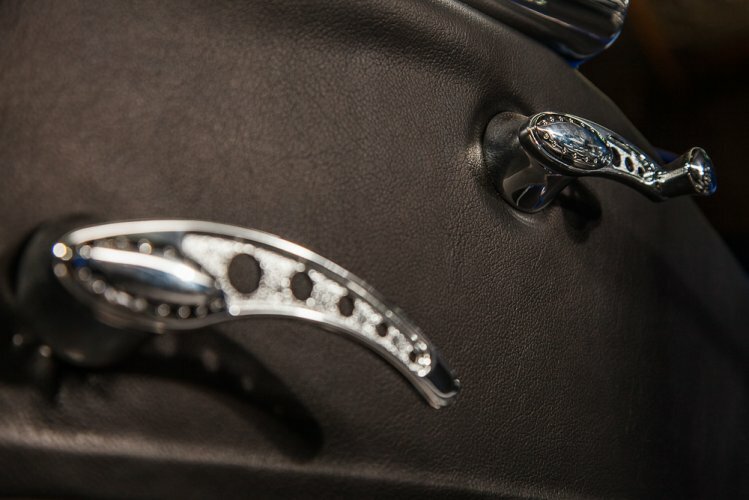 There is also a subtly designed steering wheel with a perfect mix of chrome and black leather. A Kenwood stereo with a whole range of Power Bass speakers were also wired up should you wish to drown out that Chevy big-block on a drive, but we are not sure why you would do that. With every build Bodie Stroud Industries continues to impress the masses. We hope to see more of these inspiring builds from BSI in the future!